ww2dbaseFriedrich-Wilhelm Müller began his military career as an infantryman with German 2nd Infantry Regiment in 1915. Later in the same year, he was made a second lieutenant with 266th Regiment. Remaining with the German Army after WW1, he rose through the ranks slowly but steadily, reaching the rank of major in 1936 and lieutenant colonel in 1940. As the commanding officer of 105th Infantry Regiment, he saw action with the Soviets, for which he was awarded the Knight's Cross of the Iron Cross in 1941 and Oak Leaves to his Knight's Cross in 1942. In Aug 1942, he was made the commanding officer of 22nd Air Landing Infantry Division based in Crete, Greece. He was responsible for many acts of atrocity against Greek civilians, including the massacres at Viannos, Anogia, Amari, and Damasta, as well as for the execution of prisoners of war against over 100 Italian officers on the island of Kos. In 1943, at the rank of Generalleutnant, he was made the commanding officer of 22nd Infantry Division. In Jul 1944, he was made the commanding officer of all occupation forces on Crete. 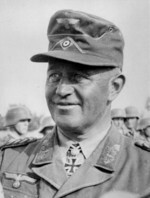 In 1945, he returned to the Eastern Front at the helm of German 4th Army. He was captured by the Soviets at the end of the war in Ostpreußen (East Prussia), Germany. He was tried by a Greek court for war crimes in 1946. Found guilty, the "Butcher of Crete" was sentenced to death by firing squad, and the sentence was carried out in May 1947. 29 Aug 1897 Friedrich-Wilhelm Müller was born in Barmen, Prussia. 25 May 1916 Friedrich-Wilhelm Müller was awarded the Iron Cross 1st Class medal. 29 Aug 1916 Friedrich-Wilhelm Müller was awarded the Iron Cross 2nd Class medal. 22 Dec 1939 Friedrich-Wilhelm Müller was awarded the Iron Cross 1st Class medal. 12 Jun 1940 Friedrich-Wilhelm Müller was awarded the Iron Cross 2nd Class medal. 22 Sep 1941 Friedrich-Wilhelm Müller was awarded the Knight's Cross of the Iron Cross. 19 Jan 1942 Friedrich-Wilhelm Müller was mentioned in the Wehrmachtbericht daily radio report. 8 Apr 1942 Friedrich-Wilhelm Müller was awarded Oak Leaves to his Knight's Cross of the Iron Cross. 18 Jun 1943 Friedrich-Wilhelm Müller was awarded the German Cross in Gold. 18 Nov 1943 Friedrich-Wilhelm Müller was mentioned in the Wehrmachtbericht daily radio report. 1 Jul 1944 Friedrich-Wilhelm Müller was mad the commanding officer of all occupation forces at Crete, Greece. 27 Jan 1945 Friedrich-Wilhelm Müller was awarded Swords to his Knight's Cross of the Iron Cross. 10 Mar 1945 Friedrich-Wilhelm Müller was mentioned in the Wehrmachtbericht daily radio report. 30 Mar 1945 Friedrich-Wilhelm Müller was mentioned in the Wehrmachtbericht daily radio report. 9 Dec 1946 Friedrich-Wilhelm Müller was found guilty of war crimes by a court in Athens, Greece. 20 May 1947 Friedrich-Wilhelm Müller was executed by firing squad in Athens, Greece.